The sun burst through the clouds before us. On a nameless hill over a nowhere town in Yorkshire, we were free. I pushed the pedal down, and the car began to cruise down into the valley below, the world unfolding before us like a golden book laced with a grey ribbon of tarmac—I never thought I’d see sights like this. We all place limits on ourselves. Some are mental; others are physical. They aren’t something I talk about much, really. I am, after all, an eternal optimist. There’s no reason to let life get you down. Aside from traffic wombles and slow network connections, the world shouldn’t be a frustrating place. And while I think we all live with certain mental limits, I’ve grown up with a very real, physical limitation of osteomalacia. You might call it rickets. It makes walking painful, traveling difficult, and it puts a limitation on the “normal” physical things that most people take for granted. I know I’ll never climb a mountain or run a marathon. For most of my life, I thought I’d never even see a mountain, but that all changed last week. It changed in Yorkshire, on a road just a few hours from the Metal Potato offices in Plymouth. It changed on a 4,000 mile road trip through Wales, Scotland, and the Yorkshire Dales in England, where that hill and those clouds and the world’s greatest road culminated in a moment of freedom. In that moment, I was just me. I wasn’t a cripple kid or disabled person. I was just a person. I was beyond any limit I’ve ever known. However you choose to do it, going for a drive can be liberating. It helps that I live not far from the countryside roads and cliffs of Devon, but anyone can go for an afternoon drive. It’s one of my favourite pastimes after a long day of web design. Driving gets me out of the office, out from behind a screen, and into the real world. No…you don’t have to visit the airport to do it. I’m not asking you to fly to another country. The hassle of airport travel is immense for anyone. For disabled people, it’s extraordinary—though I don’t mind the golf cart ride through the terminal, if I’m honest. 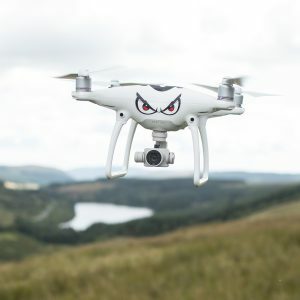 However, if you want to explore, you should fly a drone. It’s something that’s doable from any stool or chair on Earth. Drones range in size from large ones capable of recording 4k video from miles away, to mini-drones that roam about your house. For 4,000 miles, I’d take our drone (Dave) out at every opportunity, and while my able-bodied friend climbed and explored the hills and ruins of England, I tagged along with a bird’s eye view. I can’t honestly think of a more incredible way to see the world. If you can’t walk, flying will get you there—and it’ll leave you with gigabytes of memories at your disposal. What you do with those gigabytes is up to you. Edit them, delete them, send them to your mum. It doesn’t matter. The point is that you were there, you were free, and you were limitless. I think that’s something that no matter what your abilities are, you can appreciate. This week, I broke the walls down. This week, I was free.